"Iron Oxide" received the Hopewell Valley Arts Council Award. Congratulations! “Iron Oxide” is Olly in a suit of weathered armor, as if that armor has been protecting him for many years. I had an image in my head of a really rough and tough ox, and I thought, “How could I make a tough animal even tougher?” Armor! Like a knight. The armor will be mostly just painted on, but where there are seams, I used Magic Sculpt to create ridges so that he really looks like he’s wearing actual armor pieces. His “armor” will have some decorative elements on the sides. He has three armor panels, the top layer (which is attached to the body of the armor) is a rusted iron color, and the two panels underneath are painted like tarnished gold and oxidized bronze. Large bolts are screwed into the side to make decorative studs in the armor. His cowl is made out of real chainmail, attached permanently with heavy acrylic medium and with a ridge built over it with Magic Sculpt to help it stay attached. I used metallic acrylic paints for the armor, with metallic pigments mixed into make them look even more like real metal. The weathering is done using rust-colored acrylic, sponged on and lightly sanded to give it the appearance of real wear and tear. 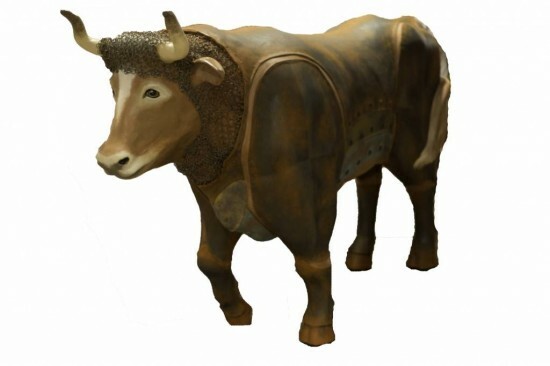 The ox’s face and parts of his body that show between the armor panels are painted semi-realistically.